Graphite can be machined with standard machine shop equipment. It is important to make provisions to control the dust created by the machining operation. There are a number of efficient dust control systems available and the method used may depend on the size and type of machining that is being performed. Graphite should never be machined without a dust collection method in operation. Graphite grades vary widely in density, hardness, and flexural and compressive strengths. These properties can affect tool pressure, tool wear and the machinability of different brands and grades of graphite. The brand and grade of graphite chosen for a particular application is often determined by the size and shape of the electrode. Electrodes of spectacular detail and close tolerances are practical when premium grades of graphite are teamed with CNC machining and design. Standard machining practices should be used when machining graphite. These include maintaining rigidity, using relief angles and a positive rake angle, keeping tools sharp and tool pressure low. Specific applications may require slightly different settings than the following general guidelines. Standard carbon-steel saw blades with ten teeth per inch can be run at 2100-3100 surface feet per minute when cutting graphite. Adjust the power feed to avoid overloading the cutting teeth or "lugging down" the saw. The best way to determine the proper power adjustment is to keep increasing the feed until, at the completion of each saw cut, the saw has a very slight speedup at the point of breakthrough. Each saw is powered and geared differently, so experimentation is required even on similar equipment. Lower the upper guide arm to allow 1/4" maximum clearance above the work to insure maximum blade rigidity. The material guide (rip fence) must be rigid in both front and back to prevent material "side play" which reduces accuracy and can also destroy the saw blade. Long rods and cylinders from high strength materials can be turned at much higher speeds than other grades of graphite. A large depth of cut can be used on heavy cylinders where deflection or "whip" is not a problem. Specialty tools capable of cutting 1" deep have been used with success on 4" cylinders 40" long. Feed rates should be low, only 0.005" per revolution for roughing and between 0.001"-0.003" per revolution for finishing operations. Depth of cut and the resulting surface finish have an unusual relationship: deep cuts such as 0.015"-0.020" produce a better finish than light cuts such as 0.005". This is because the graphite tends to chip away, or fracture, rather than cutting away in a "plastic" flowing manner that is usually seen in metals. Because of this property, no chip breaker is necessary. Cut-off tools with a square nose shape should be avoided because the tool pressure will break the part before it cuts through. Instead, use a tool slanted at an oblique angle of about 20°. High quality tungsten carbide or PCD (Polycrystalline Diamond) inserts with a positive rake angle and 1/64"-1/32" nose radius are recommended for general turning. Workpiece supports — High strength graphites can be chucked tighter than other graphites because they will build more tool pressure. Do not chuck to the point of crushing or chipping. Whenever possible, use collets to hold graphite. This practice will also speed up part change time and reduce overall fabricating costs. Live centers should be adjusted in the standard manner to prevent free turning of the material on the live center. Avoid overloading the live center. Dead centers should not be used with graphites since they wear quickly due to abrasion. Steady rests can be used, but must be equipped with live rollers. Stationary brass tips tend to wear grooves into graphite. Adjust roller pressure so that the material is turning on center. Do not overload the rollers. Follow rests should not be used when machining graphite. To prevent chatter, make sure the gibs are adjusted properly, use short tool extensions, and firmly clamp down the material. Tool breakage and wear are two problems that frequently occur when using end mills. 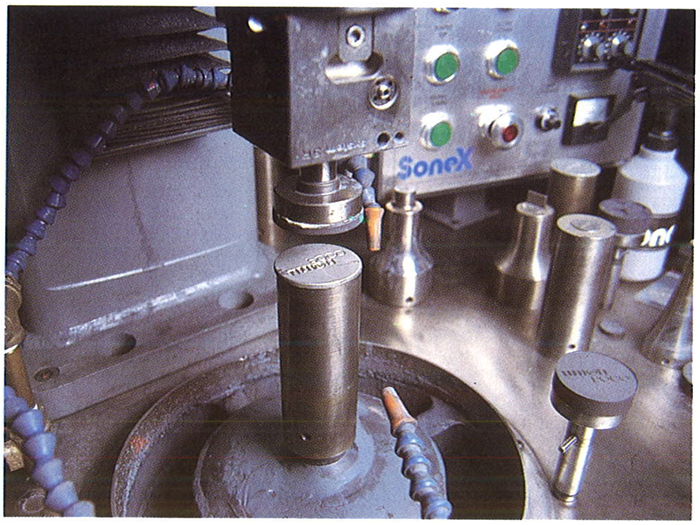 Breakage is often due to excessive tool pressure brought on by abrasive wear. Since tool wear cannot be avoided, frequent inspection and regular tool replacement are necessary. High quality end mills (Johnson, Basset, Wendt-Sonis, or equivalent) give longer wear. All mills will chip the graphite as the mill exits the side or end of a workpiece. To reduce chipping, use sharp tools, positive rake, and low feed rates. These measures will help decrease the tool pressure which causes the chipping. One very effective method to eliminate breakout is to mill a short distance into the part from the exit side before starting the cut. 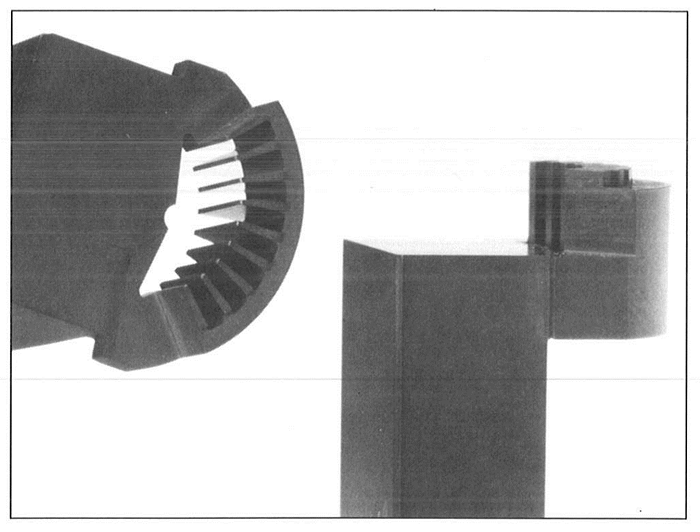 Depth of cut and chip load depend directly on equipment power, rigidity, and clamping methods. Tool chatter or insufficient clamping will cause a machine overload that can fracture the material. If rigidity and clamping are maintained properly, your machine will stall out before the material fails. 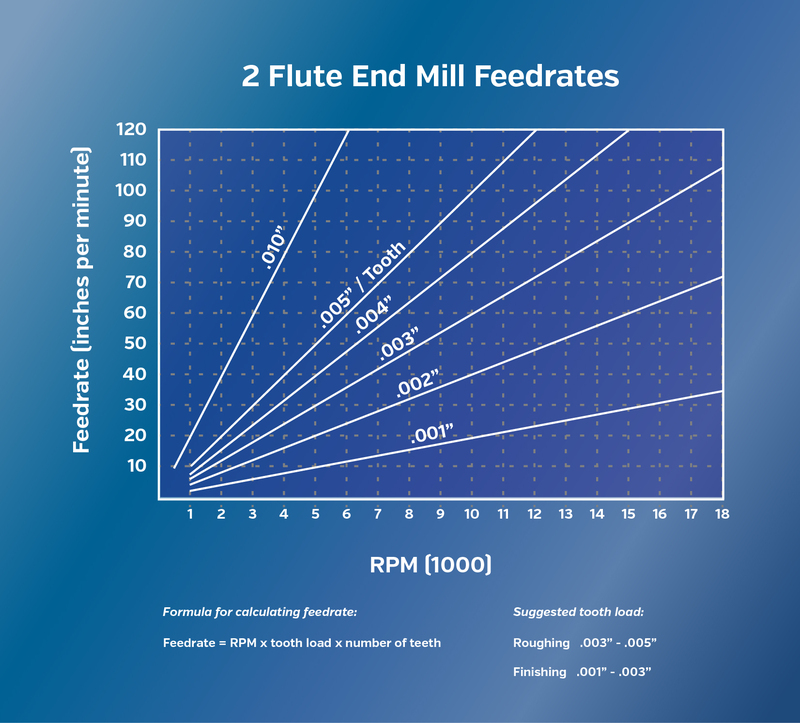 The following charts (figures 10-2 and 10-3) show the relation between feed rate, RPM, and end mill diameter. Figure 10-2. Suggested cutting speeds for machining graphite. Figure 10-3. Suggested tooth load for machining graphite. Through-hole tapping in graphite should be done with a standard tap without tapping fluid. There are several methods for tapping blind holes in graphite. Bottoming taps will cause the threads to chip when tapping blind holes in graphite. Thread chipping can be reduced by using a standard tap instead of a bottoming tap. An alternate method is to use a standard tap to start the threads and carry them as deep as possible, then follow up with the bottoming tap. The number and size of the holes to be drilled are the two factors to consider when planning and selecting tools. Low volume— When drilling only a few holes, a standard high Speed steel drill will do the job. High speed drills (standard spiral) will wear rapidly at the point and cutting edges due to the abrasive nature of graphite and should be checked frequently. The hole size can start to change or taper after only a few holes are drilled. High volume — For high volume drilling of holes over 1/16" diameter, high quality tungsten carbide tools are preferred since their long life reduces maintenance and tool changes. Although carbide drills will last much longer than steel drills, they are very fragile in small sizes (under 1/16"). Overall performance may be improved by using high speed steel drills for small holes. PCD tipped drills will last the longest. In drills under 1/4" the diamond tends to debond from its backing material. This is caused by the buildup of heat due to friction as the dust packs the hole. Figure 10-4. Machining burrs are not raised when a graphite backup plate is used during through-hole drilling. The spindle is shrouded to aid dust collection. Deep hole drilling — Dust packing is a problem in most deep hole drilling (anything over 3x the drill diameter). Dust packing along with high RPM and slow feed rates increases friction. This causes rapid heat buildup that will rupture the drill. To prevent the drill from breaking, use a peck cycle to remove dust. Pecking should be done with rapid extraction to remove as much dust as possible. High spiral drills, those having more than the usual number of flutes per inch, will minimize this problem. When practical, use drills with through coolant holes and inject compressed air to remove dust from the bottom of the hole. Feed rates for drilling are 0.0015"- 0.0020" per revolution for 1/32" and smaller drills, 0.001"- 0.003" per revolution for 1/32" to 1/8" drills, and 0.002"-0.005" per revolution for larger drills. 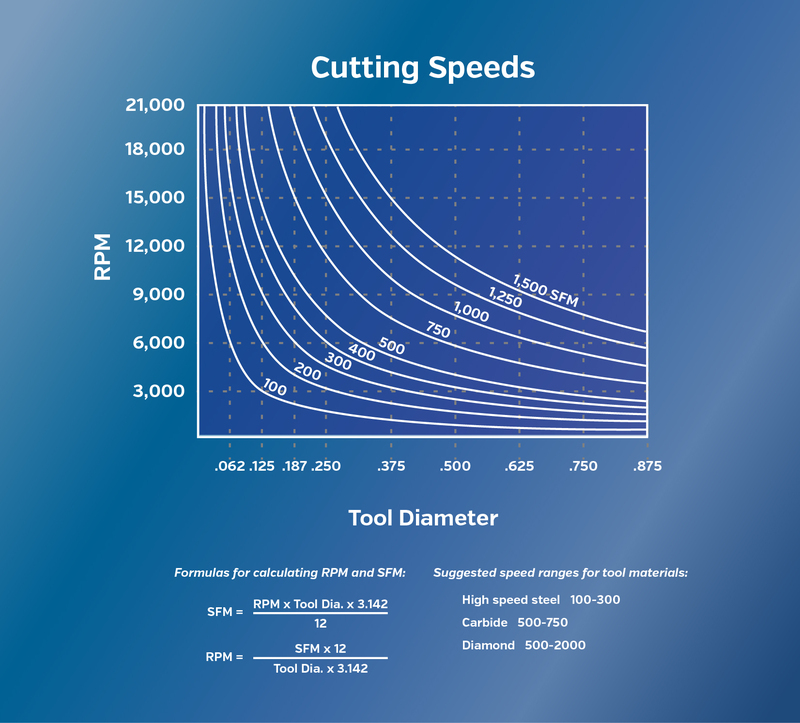 RPM is determined by the diameter of the drill and the tool material selected. Core drilling— Diamond faced (plated on) tools (Diachrome, Norton, or equivalent) should be used for core drilling. Flush the inside of the core drill with compressed air at 40-80 psi while the dust is collected by a vacuum shroud on the outside of the drill. When using hand feed, the drill should enter the part at about 125 RPM and continue until the cut becomes established. Then the drill speed should be increased until it is between 500 to 600 RPM depending on the core size. Gundrilling — Smooth, accurate holes can be gundrilled in graphite. Unlike metals, there are no large chips to plug ejector holes or flutes. Graphite produces small (0.001"-0.010") particles that can be flushed away with a good supply of compressed air. When using compressed air, place a dust collection shroud around the gun drill where it enters the part. The standard commercial broach is designed for metal and takes too heavy a chip load per tooth for graphite. This heavy chip load will cause large chips to be broken off the bottom of the part where the broach exits. If possible, use a single tooth keyseat cutter instead of a broach. If you have to broach, leave extra material on the exit side of the part so the chipped edges can be machined off after broaching (0.100"-0.150" is usually enough). Support the graphite as close as possible to the broach. 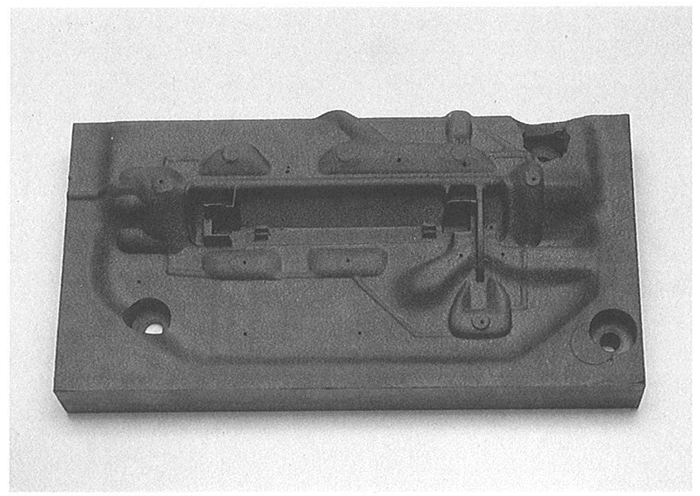 Keyseating — A single tooth keyseater can produce fair to good results in graphite. To get good results, select a fine feed (0.001"-0.004" per stroke) and use sharp carbide tooling. High speed steel will work for short run jobs, but will quickly dull. Dull tools will cause tearing of the graphite in the cut, and large chips will be broken off the bottom of the part where the tooth exits the cut. Even with fine feeds, graphite will tend to chip slightly on the exit side. If too heavy a feed rate or dull tools are used, heavy chipping will occur. 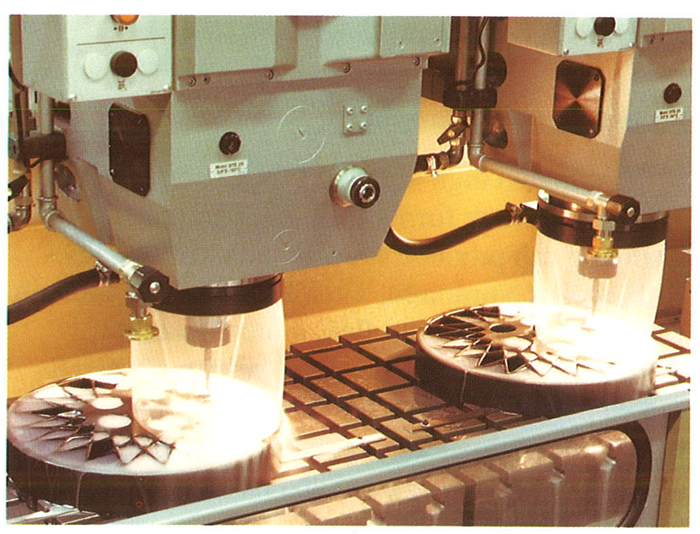 Surface grinding — Standard surface grinders can be used with graphite, but the wheels must be kept sharp. The most common grinding wheel used is a green wheel, composed of 60 grit silicon carbide (Norton, Carborundum, Cincinnati, or equivalent tools, medium grade, medium open structure, vitreous bond). Run the wheel at 5300-6000 surface feet per minute (but do not turn the wheel in excess of the RPM recommended by the manufacturer on the wheel label). On large, repetitive jobs use diamond grinding wheels. They will maintain sharp corner radii and close tolerances. Although they cut slower than silicon carbide and are more expensive, they do not need to be dressed as often. Roughing cuts generally take about 0.005" to 0.010" per pass while finishing cuts are made between 0.001"-0.003". The surface feed rate for either cut is approximately 56 feet per minute. Avoid overfeeding so that the dust can be removed ahead of the grinding wheel. The best method to remove graphite dust is to provide a strong dust collection vacuum on the discharge side of the wheel with compressed air blowing at the entrance side of the wheel. 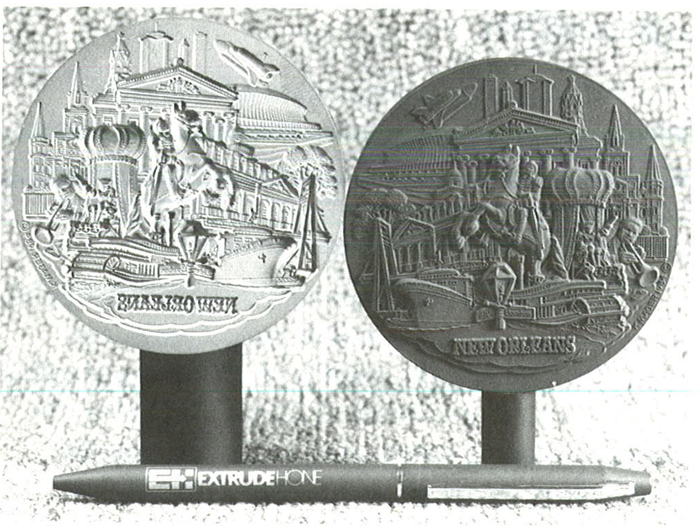 Surface ground finishes are typically in the 1832 µin Ra range. Smoother finishes can be obtained by standard practices (increasing sparkout, finer grit wheel, etc.). Typically, finishes below 8 µin Ra are difficult to achieve. Lapping should be used to obtain smoother finishes. Thin Sheets — To grind sheets thinner than 0.010", use 0.040" thick sheets with a band saw or sanded finish. Vacuum tables are typically used to hold the sheets during grinding. The first step is to grind off one side of the sheet, primarily to eliminate the rough finish. When this is done, flip the sheet over. The improved surface finish allows a good strong vacuum to develop and the sheet will no longer "breathe" up and down. Continue grinding until the sheet is as thin as required. Remember, the finer the structure and the stronger the graphite, the thinner the sheet can be ground. Grinding a graphite with a 1-micron particle size and a flexural strength of 17,000 psi will produce better results than using a graphite with a 20-micron particle size and a flexural strength of 6,500 psi. Centerless Grinding— Although graphite is generally machined dry to ensure that no contamination is introduced, sometimes it is not practical. The heat that is generated in centerless grinding would destroy the grinding wheel if fluid were not used to remove some of the heat. Figure 10-5. Dust collection should be built into the grinder wheel guard. A vacuum table is used to hold the part. Use a silicon carbide resinoid bond work wheel and a regulating wheel surface speed of about 195 feet per minute. This will generally produce a finish of 64 µin Ra or better. Since more force can be used on high strength graphites, a 0.312" square rod can be through ground to a 0.250" round in a single pass. Larger sizes should be cut in an octagon shape prior to grinding. 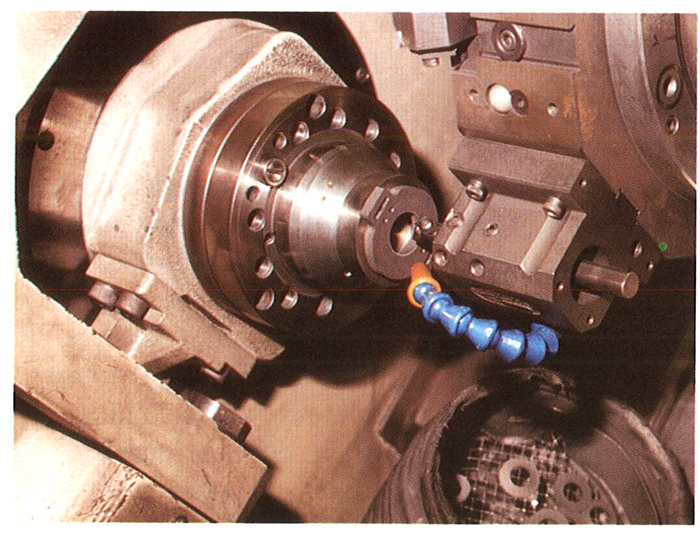 Close tolerances can be held on centerless ground parts. The standard tolerance for POCO Rods which are through fed is 0.0002". Crush feed grinding also works well and is suited to volume production of small round parts with fairly complex profiles. Although high-strength POCO graphites can be clamped more firmly than other graphites, over clamping can produce warped parts just as it does with steel or aluminum. Their high flexural strength allows them to bend, or flex, more than other graphites. With gentle pressure, permanent bends can be put into the rod, similar to those in a metal rod. While high-strength graphite will not bend as far as metal, they will bend and have a permanent deformation. Several types of clamping are popular with graphite. The simplest to use is the standard strap or toe clamps with occasional through bolts and locator pins. There are many modular clamping systems in use which use this arrangement and they make the change over from part to part relatively quick. For greater accuracy, use the same tooling during the electrode fabrication process that will be used during the EDM process. This gives the lowest positioning error when locating the electrode for machining or EDMing. In cases where the electrode is thin, or very delicate, special pockets should be cut in the fixture to hold the part during machining. 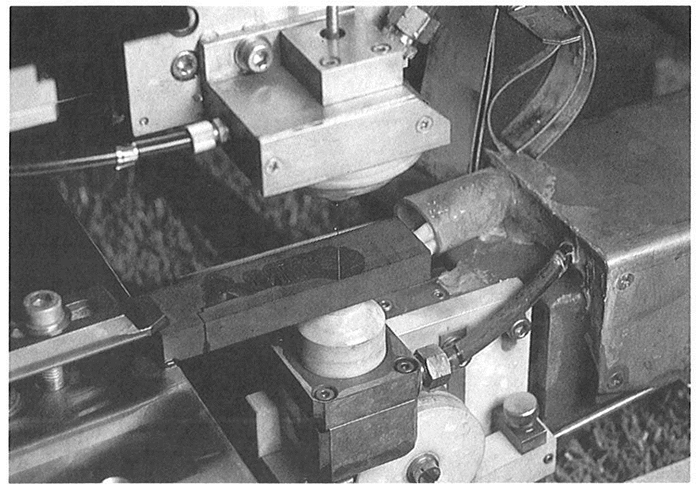 Vacuum Fixturing— Use vacuum to hold the part when five-sided machining is called for. 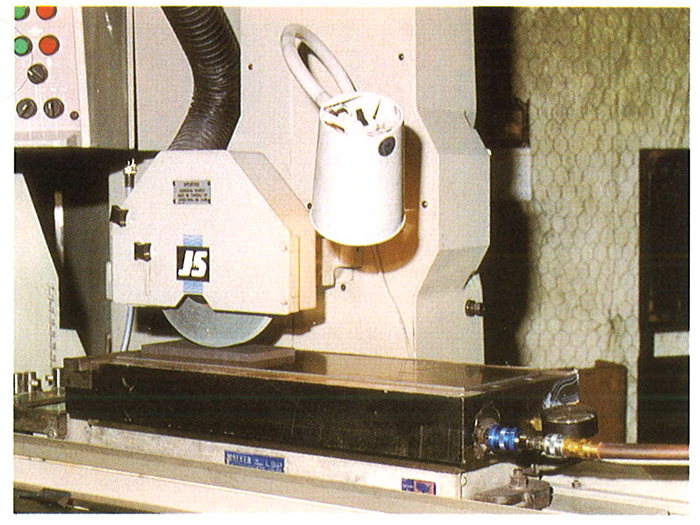 Quite often, use of vacuum can eliminate one or more machining setups. 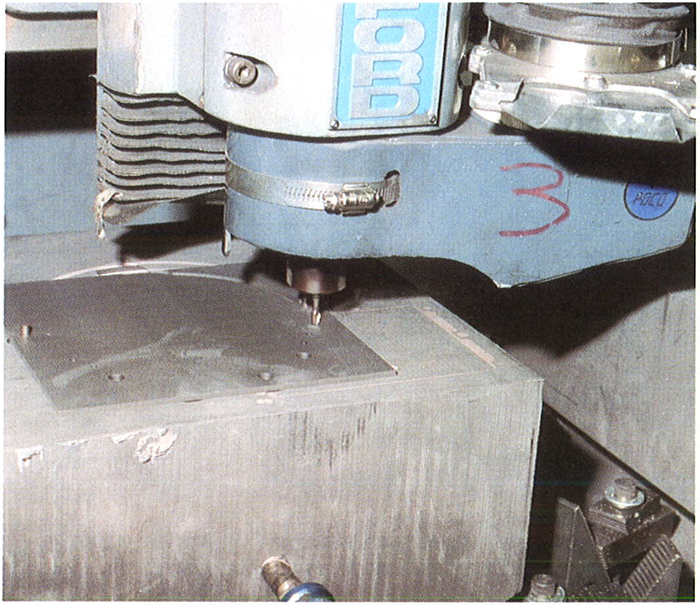 POCO uses vacuum tables extensively to hold parts for surface grinding. Power Clamping — Power clamping with pneumatics or hydraulics is popular for high volume jobs because it reduces the time necessary to clamp each part in place. When using hydraulics, reduce the hydraulic pressure to prevent chipping or cracking the part. When using pneumatics, a line restrictor will prevent the air cylinder from slamming the clamp into the part and chipping it. Often, a small air control valve will serve as a flow line restrictor. As a material, graphite does not need a coolant because it has excellent high-temperature characteristics. Although graphite generally needs no coolant or cutting fluid, some high friction machine parts do, such as those in a centerless grinder. In these cases, water is used with a rust inhibitor to protect machine parts. Since graphite is porous, liquids (even water) used to lubricate, cool, or flush can penetrate the pores and introduce impurities into the graphite. Impurities can cause problems in some applications. After machining with coolant, expose the finished parts to a temperature of about 400°F for one hour to remove the liquid (do not use a microwave oven). Graphite does not make large chips like metal. Instead, in many operations it will make small chips about 0.00l"-0.005" across. Heavy milling operations will make larger chips and grinding operations will make a fine dust. The two basic ways to capture dust and chips are high air velocity with a dust collector and fluids. The air with dust collector method requires the most planning and attention to detail. It also produces the cleanest parts. When capturing dust, an air velocity of 500 feet per minute or higher should be used. Once the dust is in the dust collector lines it should be moved at about 2,000 feet per minute to keep the dust suspended and prevent it from settling out of the air stream inside the duct work. A screen or trap should be set up before reaching the dust filters to catch any large parts which might enter the dust collector lines. This screen will help prevent damage to the filters by stopping those fast moving high velocity parts. A book which covers dust collection from a practical standpoint is INDUSTRIAL VENTILATION: A Manual of Recommended Practice by the American Conference of Governmental Industrial Hygienists. The other collection method is the use of fluids. Directed streams or fluid curtains around the spindle can be used to trap the dust. The simplest method to remove graphite from the fluid is to use a weir tank, but this will only remove the largest particles. Fine graphite particles will remain in suspension and be re-circulated over and over. A better (although more expensive) method is to use a filtration device even though filters will tend to clog quickly and require frequent replacement. A centrifuge will remove most of the suspended matter and systems are offered by many companies. Rigid Machine Tool, Inc. offers a complete system for control of graphite dust, from a water curtain which surrounds the spindle to the clarification unit to remove graphite solids. Figure 10-7. The end view of the dust collection hose shows a screen in place to block large chips from entering the air line. This lathe has a vacuum chuck to hold the graphite. An air nozzle removes dust from the cutting area. The abrading process takes advantage of graphite's brittleness relative to metals. All classes of graphite can be used successfully in this process. The following description is one of a number of methods of abrading currently in use. Two horizontal platens are brought together as they move in a precise orbital path. One platen holds the abrading die and the other holds a graphite block. As the two platens are brought together, the abrasive forming tool is ground into the graphite. This cutting action produces a very fine surface finish on the electrode. The abraded graphite is washed away by a flow of flushing fluid through the machining gap. The abrading process is a dependable, repeat-able, cost-effective means of producing larger dies and molds. Graphite dust is eliminated by flushing. 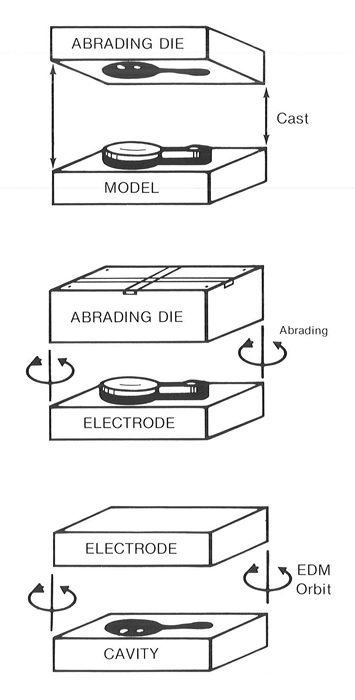 Electrodes are easily redressed or reproduced, and benchwork is usually unnecessary. This method also takes advantage of graphite's special characteristics. 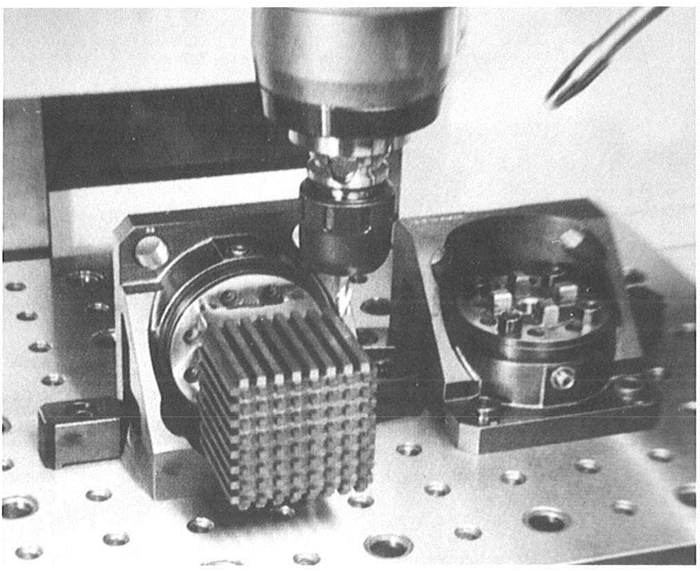 Ultrasonic machining is also an abrasive process, but on a very different principle from the abrasive master process. The ultrasonic machining equipment is similar to the ultrasonic cleaning devices used to clean jewelry, small parts, etc. However, this equipment uses much higher power levels which results in the controlled abrasion of porous materials such as graphite. 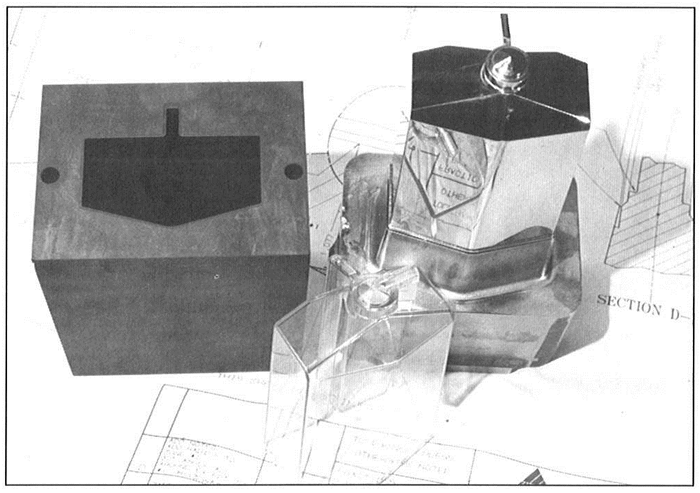 A metal sonotrode is fabricated to the desired shape. The sonotrode is mounted to the transducer in the machine base. A graphite blank is attached to a tool holder on the feed ram. The ram is lowered and a water-based abrasive slurry is pumped into the gap. An ultrasonic signal with a frequency of about 20,000 Hz is applied to the transducer/sonotrode, causing the abrasive particles to vibrate in the gap. These vibrating particles actually abrade the graphite blank. The overcut is controlled by the size of the abrasive particles and can produce an undersized electrode. The graphite is very quickly conformed to the shape of the sonotrode, and the graphite particles are flushed away by the slurry. Ultrasonic machining has proven capable of resolving details and radii down to 0.002", surface finishes to 8 µin Ra along with advantages of unattended operation, easy redressing, and repeatability. Electrode size is currently limited to about 4" in diameter, and deep cavities are not yet practical. Wirecutting provides extremely fine detail and close tolerances, plus the advantages of unattended operation and low cost production. The operating theory is precisely the same as a ram-type EDM, but the practice is very different. Deionized water, an excellent insulator, is used instead of oil as a dielectric. The electrode is a computer-controlled continuously fed wire. A basic wire EDM functions very similarly to a jigsaw, but advanced machines are now doing multiple axis machining at tolerances and material removal rates not dreamed of a few years ago. Wirecutting of graphite and metallic electrodes is becoming increasingly popular. Dust control is obviously not a factor in wirecutting of graphite. However, cavities are not possible, and only certain grades wirecut well. Certain premium high density graphites (EDM-AF5 and EDM-3) and copper infiltrated graphites (EDM-C3 and EDM-C200) wirecut very well, but lesser grades do not produce dependable results. Wirecut was developed as a metal cutting method, and was expected to decrease premium graphite usage in through-hole applications. While this has happened to some degree, the discovery of the excellent wirecut characteristics of premium high density graphite has made wire EDM yet another efficient means of producing close tolerance, extremely detailed electrodes for ram-type EDMs in applications requiring cavities.